Kirk Bell October 16, 2018 Comment Now! I’m hustling through the Spanish countryside getting a back massage, attacking roundabouts with gusto in a car that can sprint from 0-60 mph in less than 5.0 seconds, and my passenger is sound asleep. This car does just about everything well. It’s quiet, fast, smooth, spacious, and luxurious. While the car it’s replacing is still quite competitive, this one is clearly a leap forward. I’m in the 2019 Audi A8 60 TFSI, the V-8-powered, 460-horsepower version of Audi’s flagship that will likely arrive a few months after the V-6 version. It’s a technological tour de force and it doesn’t even have all of the goodies that Audi will eventually bring to the table. What enables one car to offer so much capability? As Audi would say, it’s vorsprung durch technik, or advancement through technology. It starts with the structure and chassis. The A8 no longer uses an aluminum spaceframe (truth be told, it was always steel and aluminum). Audi now employs a multi-media approach. The structure is a combination of high-strength steel, aluminum, magnesium, and even carbon-fiber-reinforced plastic. Through the smart use of these materials, the new structure has 24 percent more structural rigidity than the outgoing spaceframe, and it weighs less, too, though Audi isn’t saying how much. The aluminum content is up to 58 percent, and the carbon fiber and magnesium also help cut weight. The available suspension technologies are more advanced. The base suspension is an aluminum five-link setup both front and rear with air springs and electrically adjustable dampers. That’s pretty advanced right out of the box. From there, buyers will be able to opt for the 48-volt-powered electromechanical predictive active suspension that uses electric actuators to press the tires into ruts or pull them up over bumps. The system is tied into a forward-looking camera that can see 66 feet ahead and tell the actuators to raise or lower the wheels and body up to 4.3 inches to mitigate the effects of speed bumps, potholes, or other road imperfections. On top of that, buyers can get rear-axle steering and an active rear differential to help control rear traction out of a turn. Audi's Dynamic All-Wheel Steering is an especially aggressive system that can turn the rear wheels up to 5 degrees opposite the fronts (3 degrees seems to be the industry standard) at speeds up to 37 mph to make the car rotate and shorten the turning circle to a compact car-like 38.7 feet. At over 37 mph, it turns the rear wheels 2 degrees in concert with the fronts to increase highway stability. This system also includes variable ratio steering that ranges between 9.5:1 at low speeds and about 16:1 at high speeds. 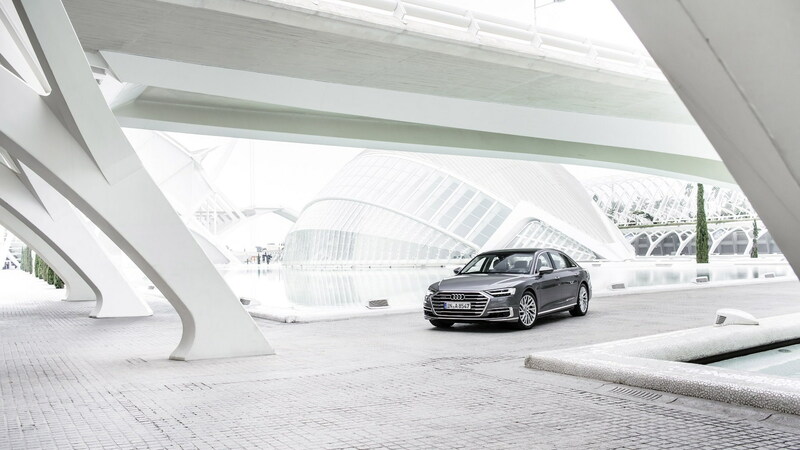 The 2019 A8 comes to the U.S. in only the long-wheelbase A8 L body style, which is 5.1 inches longer than the standard sedan. Compared to the outgoing car, it is 1.5 inches longer and sits 0.7 inch higher. At 123.2 inches long, the wheelbase is just 0.2 inch longer. At launch, we will only see one engine. The A8 L 3.0 TFSI is powered by the twin-scroll turbocharged 3.0-liter V-6 found in Audis like the S5 and SQ5. Here, it produces 335 horsepower and 369 pound-feet of torque. That power is sent through an 8-speed automatic transmission to all four wheels via standard all-wheel drive. Audi quotes a 0-62 mph time of 5.6 seconds. While it won’t come until perhaps a few months after launch, the U.S. will also get likely offer the twin-turbocharged 4.0-liter V-8 making 460 horsepower and 487 lb-ft of torque. No 0-62 mph number has been given, but expect it to be in the 4.7-second range. Both engines are considered mild hybrids because they have a 48-volt electrical system with a belt-alternator/starter, a stop/start feature that works below 13.7 mph, a coasting function that shuts the engine off to save fuel between 34 and 99 mph, and brake energy recuperation. U.S. buyers also won't get the coasting feature. The A8 L 60 TFSI I’m driving (it won't get that name in the States; expect something more like A8 L 4.0 TFSI) is equipped with the Dynamic All-Wheel Steering, the rear differential, and a prototype version of the predictive active suspension without the predictive function enabled by the camera. Among the many reasons my dozing companion remains undisturbed while I pitch the car through roundabouts and accelerate hard into the straights are the predictive active suspension and the exacting measures Audi took to quell noise in the cabin. 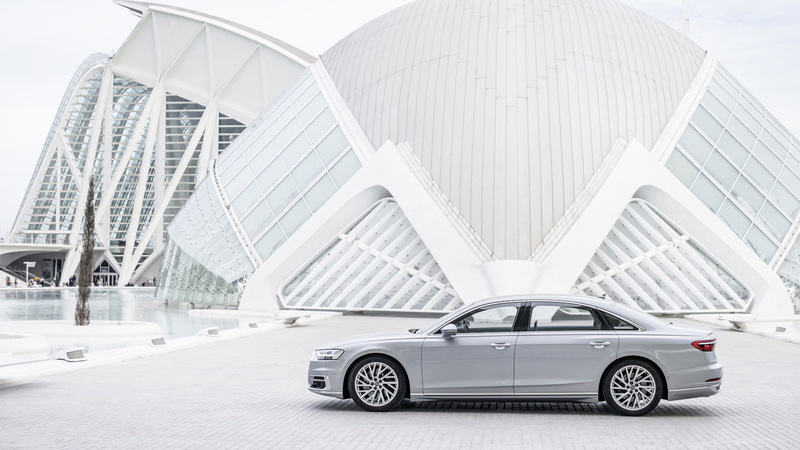 The air springs and electromechanical actuators counteract lean in corners, making the A8 a sportier proposition than a Mercedes-Benz S-Class and putting it on par with a BMW 7-Series. 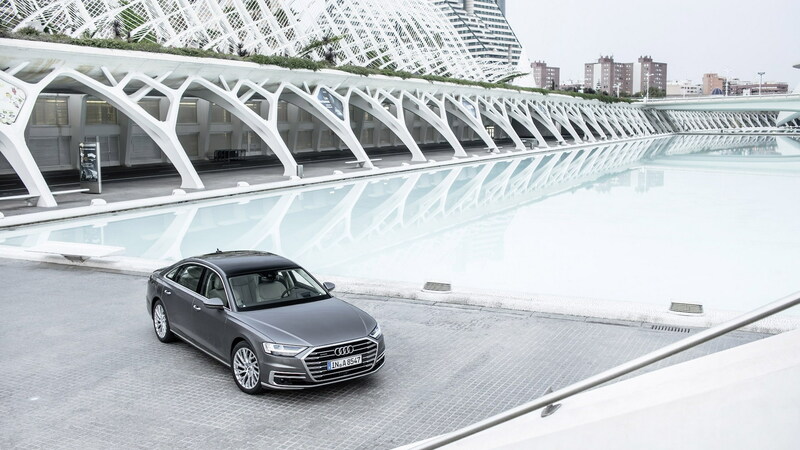 In fact, that aggressive rear steering makes the A8 drive smaller than its considerable size, giving this car the feel of a mid-size sport sedan when the drive mode selector is in Dynamic mode. Despite the vast range of steering ratios, the variable ratio steering is predictable. It's light in Comfort mode and stiffens up at speed in Dynamic mode. The suspension also provides a buttery smooth ride that is aided by Spain’s often pristine roads. The V-8 makes a refined howl, but never really intrudes on conversation or slumber. The V-8 and 8-speed automatic is a wonderfully smooth combination as well. That Dynamic mode holds gears longer, but the 8-speed still shifts smoothly, and the V-8 has waves of refined thrust. The V-6 I drove earlier is smooth and fast as well; it just doesn’t sound as good when pushed and isn’t quite as fast. Still, 335 horses are enough for any of us. Another reason Mr. Sleepy is so comfortable is the incredible quality of the A8’s cabin. Audi has been at the forefront of interior quality for a decade or so, but the cossetting cabin of the fourth-generation A8 is clearly a marked advancement. The cockpit is thoroughly modern, blending high tech and luxury in a horizontal layout with carefully chosen materials. Real metal and open-pore wood trims the cabin, complementing the leather on the seats, dash, and doors quite well. The leather has a soft, natural feel, and the front buckets offer more than enough adjustments and range of motion to tailor a comfortable seating position. While I'm enjoying the driver's seat's Stretch massage function, my slumbering companion is content with the supportive passenger seat. We both benefit from the 1.3 inches of extra space of this generation's cabin, as well as the larger door openings that ease entry and exit. While the front seats are roomy and comfortable, my exhausted passenger is missing out on an opportunity. Our car has the Rear Seat Relaxation package featuring rear bucket seats with footrests, an extended rear center console, four-zone automatic climate control, rear seat entertainment, LED matrix reading lights, a folding table for the right rear seat, and a massage function for all four seating positions. As good as his slumber is up front, he would be even more comfortable in the back. Plus, he could have used the new rear seat remote to control the climate and infotainment functions. Audi paid attention to the details, too. Accent lighting is used throughout the cabin. Press a button on an air vent, watch it retract, and a panel covers its position in an impressive mechanical dance. The doors are electrically activated, and they even use the blind-spot cameras to make sure they won’t open if a bike or car is coming; the doors also have soft-closing mechanisms. The tech is a step forward, too. No screen juts up from the dash, as is the trend nowadays. Instead, Audi integrates one 10.1-inch screen into the panel, and another just below it into the center console. The top screen handles infotainment commands, while the lower screen controls climate functions and recognizes handwriting, which used to require a separate pad. When entering commands such as navigation destinations or point of interest names, users can now write the whole name at once with a fingertip instead of scrawling one letter at a time and pausing between letters. These screens represent the newest generation of Audi’s MMI system, which does away with the familiar rotary dial. In fact, it does away with most buttons entirely, opting instead for touch controls with aural and visual haptic feedback through both screens. Audi calls it MMI Touch Response and it has a lot of new functions. It offers an LTE Advanced hotspot for a wi-fi connection, which Audi says is a world first; hybrid radio functionality that can switch between FM, AM, and online radio to maintain a station when you drive out of its broadcast range; and advanced natural voice recognition that connects to the cloud and can provide Yelp ratings. The system is quick and seems to be intuitive. I'll have to live with it to render a more informed opinion, though. It’s almost as if my companion could be napping behind the wheel, too. 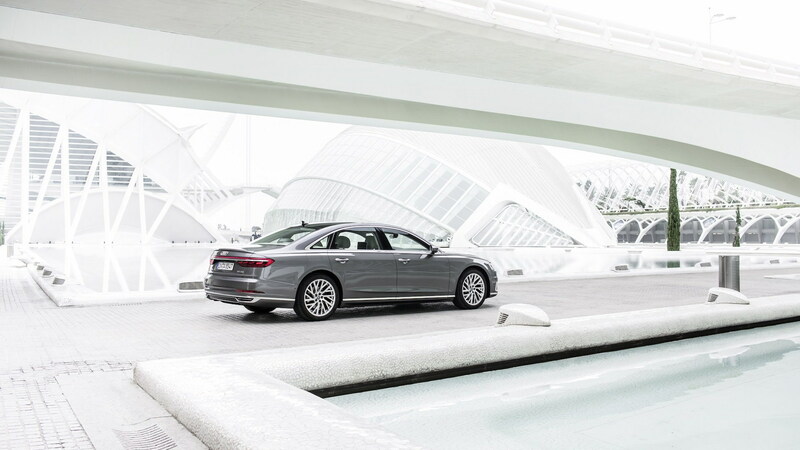 A lot has been made of the 2019 Audi A8 being the first car to offer Level 3 autonomy in the U.S. Unfortunately, this car doesn’t have it and I haven’t been able to test it. The system will take over steering, braking, and acceleration if the car is traveling at 37 mph or below, with a hard barrier to its left—like a concrete lane divider or a line of cars—and a vehicle is in front of the car. Audi’s Traffic Jam Pilot is an appropriate name. Traffic Jam Pilot won't be available at launch because its level of autonomy isn't legal in the U.S. It will likely come later once the U.S. Senate sets a nationwide standard for self-driving cars. In the meantime, the 2019 will offer some other cool tech. An AI button on the center console will be used to activate Traffic Jam Pilot as well as Audi AI Parking Pilot. The latter can scan for perpendicular and parallel parking spots and control the steering, acceleration, braking, and shifting to guide the car into them and drive it out. The driver need only stop the car, then hit and hold that Audi AI button. The Maneuver Assist function will give steering suggestions in tight spaces to keep the car from hitting objects at speeds of 6 mph and below or apply the brakes to stop the car if it will hit something. Audi Remote Garage Pilot works through a smartphone app. Hold the AI button on the app and you can move the car into a garage spot remotely. It’s best used if the car will be parked too close to a wall or another vehicle for you to get in or out. 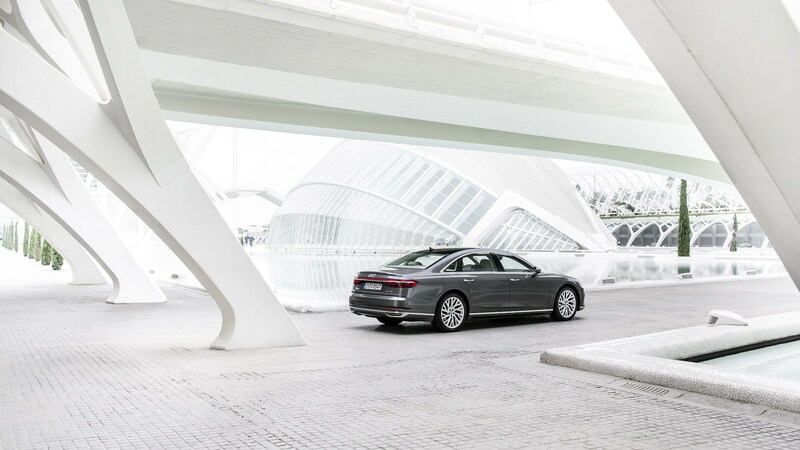 The 2019 Audi A8 is at the forefront of technology, yet it doesn't forget buyers who value luxury and sportiness. The cabin bristles with screens and connectivity, but it's as comfortable as any car on the market. A smooth ride and sporty dynamics are made possible by some advanced suspension systems. And refinement is the theme that runs through all the systems, so much so that your passenger can sleep while you have fun behind the wheel. Audi provided travel and lodging to Internet Brands Automotive to bring you this firsthand report.